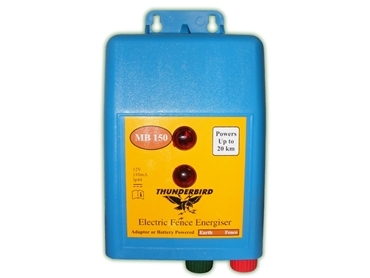 Rural Fencing Supplies stocks a range of Thunderbird small to large mains and battery energisers as well as self contained solar energisers that have designed especially for powering rural and agricultural electric fences. The Thunderbird range of energisers includes models to suit all purposes, budgets and business needs. There are energisers in the range that are capable of powering electric fence of 2km through to 20km in length. Visit the Rural Fencing Supplies Website for further information on individual energisers in the Thunderbird range and to gain advice on choosing an energiser that is suitable for your electric fencing power requirements.